When people ask what we are doing this summer, I answer, “going through the Northwest Passage”. But that statement, said in passing to satisfy the momentary curiosity of the asker, does not do justice to what amounts to nearly half the mileage of the journey: out of the Puget Sound, up the inside passage, out to Haida Gwaii, and all the way around Alaska. The first stretch we did quite quickly, covering the 550 nautical miles and assorted navigational hazards from Port Townsend to the southern tip of Haida Gwaii in eight days. The weather windows were favorable, so on we went, saving our lay days for that particular place we all wanted to visit: Haida Gwaii. Haida Gwaii (“Islands of the People”) is an archipelago comprised of over 150 islands positioned 130 miles northwest of Vancouver Island. It is a wild and primitive place where tall rugged cliff bands plummet into deep scoured fjords and old growth forests host immense trees that shield the soft moss-covered floor below. The weather is fierce and impulsive, the tides and current flows are dramatic, and the land is steeped in fascinating geological and anthropological history. During the last ice age, the sea level on Haida Gwaii was 150 feet lower than it is now, exposing almost all of the shallow Hecate Strait that separates the islands from the rest of British Columbia today. Burdened by the immense glaciers piled over the continent, mainland British Columbia sank down under the weight. Like a see-saw, Haida Gwaii (also under some ice, but not fully cloaked) rose from the sea to compensate. As the glaciers receded some 12,000 years ago, the land rebalanced and the seas rose once again. Some ancient Haida stories reference great flooding, corresponding with this time of sea level rise. Before the ice receded and the waters rose, the Haida people had already established communities along the islands. Recently uncovered artifacts (some of which were found 150 feet below the present-day tide line, reaffirming the lowered sea level) date back 13,800 years, which makes the Haida among the earliest known human habitants in all of North America. For thousands of years, Haida tribes settled, innovated, traded, grew, traveled and lived in this secluded land. Their cultural stories and principles instilled morality, generosity, strength and pride, passed down through the generations. In the peak of their society, the Haida community was 30,000 strong. We started our exploration of Haida Gwaii on SGang Gwaay, or Anthony Island, an ancient summer village site in the southern islands. 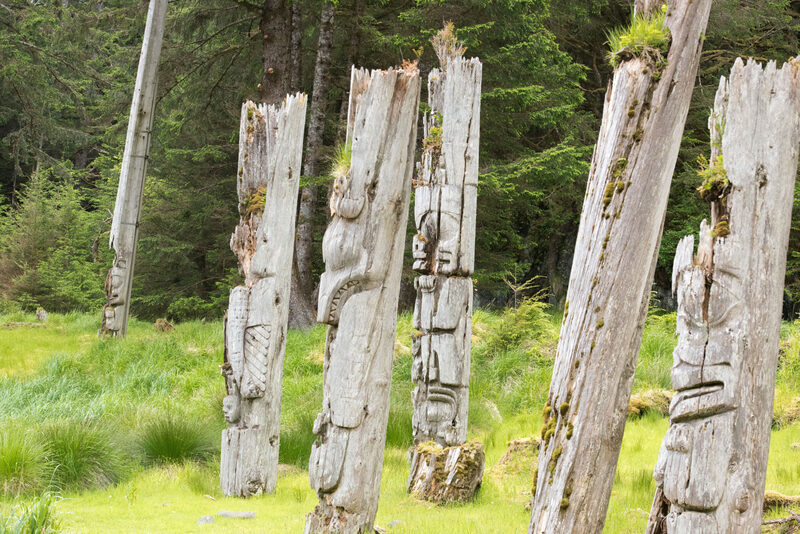 This site is one of five Watchman Sites sprinkled throughout the Gwaii Haanas National Park Reserve and Haida Heritage Site (a protected area comprised of 570 square miles and 138 different islands). Historically, watchmen were posted around a village to raise alarm in case of an intruder. Today, dotted around Gwaii Haanas, dedicated watchmen protect culturally significant sites and share their deep knowledge of the area with visitors. Vince, a friendly Haida Watchman, shared his impressive knowledge, distinct perspective and palpable devotion to the history and culture of his people as he led us around the island on a private tour. We marveled at the intricately carved totem poles as he described the distinctions between mortuary poles, the tallest poles with a cavity at the top to hold a burial box of remains, and memorial poles, intricately designed poles erected in the memory of a deceased leader. We peered over the longhouse remains, imaging the life of the community members when SGang Gwaay was at its peak some 200 years ago as he regaled us with stories of how his ancestors both used and cherished the world around them. But these stories of revelry and equilibrium are marred by the recent past. As is true in too many native cultures around the world, the Haida’s interaction with Europeans had a truly devastating impact on their society. Traders arriving on the coast in the 1800’s shared small pox and other western diseases with the natives, effectively decimating the Haida population over a few short decades. In 1884, the 30 disease survivors in SGang Gwaay abandoned their homes to band together with the other survivors around the islands. In the end, there were as few as 400 Haida remaining. There follows an infuriating period of insolence, destruction, disrespect and vandalism in which youth are shipped off to residential schools, sacred artifacts are whisked away and the very core of the Haida culture is threatened. But the Haida are strong. And they are slowly (very slowly) rebounding. Vince shared his heartbreak over all that has been lost, but he also shared his optimism in the progress being made. Gwaii Haanas, established by the government of Canada and the Council of the Haida Nation, is the first reserve to be cooperatively managed. Haida leaders have repatriated totems and artifacts from museums across Canada, the US and Europe. Environmental regulations are protecting fragile ecosystems and the endemic species that call these remote islands home. Haida youth are engaged in their communities, learning the stories and ways of life from their elders to pass down to their children. It’s a long view, Vince admits, but it’s hope. Walking through the lush forests and along the rocky beaches of SGang Gwaay, I could feel the energy of the wisdom, balance, struggle, suffering and fortitude embedded in the Haida community that dried their fish and hosted their potlatches and raised their families on that shoreline. Over thousands of years, they witnessed the earth heave and shift, glaciers ebb, mountains form, the sea rise up. And on they lived. We had been in Haida Gwaii less than four hours and I was spellbound. I didn’t want to leave SGang Gwaay, but the anchorage was not protected for the incoming SE gale, and we had miles to cover before the end of the day. As we motored up the shore, the jagged shorelines offered peeks into life in this land: old growth forests, fishing holes, burial grounds and logging scars. How fortunate we are to get to see such a place! If you like this story, will you support us on Patreon? Very nice post regarding your trip up the inland passage. Thanks for following along, sv Elizabeth Jean!